Schaefer Lazy Jacks are designed to control the mainsail when reefing or dousing. They work easily with modern full batten mainsails or with traditional sails. 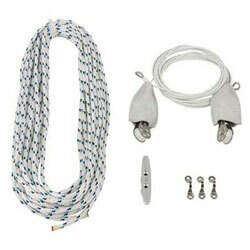 Includes: Two lengths of 14' (4.3m)vinyl coated wire with blocks, chafe guard and thimble attached, one length of 75' x 1/4" (22.9m x 6mm) yacht braid, eye straps, fasteners and cleat.